While the weather here has not completely warmed up to my liking just yet, it is slowly getting there. We had another 3 inches or snow of snow this past Friday but luckily most of it has melted away already, even though it has been windy and chilly here. the promise of spring is coming with warmer weather on the horizon towards the end of this week so maybe I will actually be able to walk out onto the back lawn without worrying about slipping and falling on the ice. in the meantime, I decided to warm things up in the kitchen a little bit by making a nice spicy meal for dinner the other day. 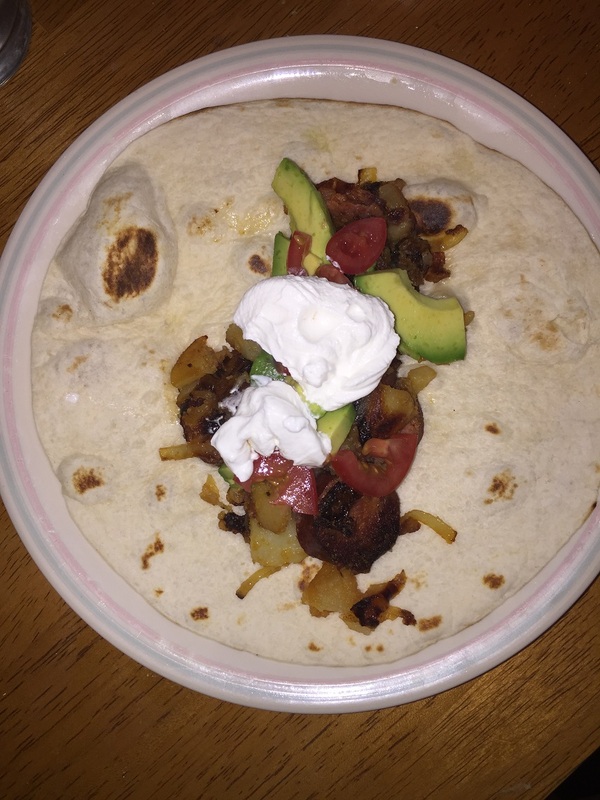 I had picked up some freshly made chorizo when I went shopping and wanted to make something with it that was quick and easy so I decided to try out this recipe, which I found at Serious Eats, for crispy potato and chorizo tacos. With only a few ingredients needed it seemed like an easy meal that would come together quickly and promised to taste great. Place the diced potatoes in a large pot and cover with cold water by 1 inch. Add the vinegar and 2 tablespoons of kosher salt. Bring the potatoes to a boil over high heat and cook until the potatoes are just cooked through, about 5 minutes after coming to a boil. Drain the potatoes and let them rest over sink until they are mostly dry. Heat 4 tablespoons of the vegetable oil in a large non-stick or cast iron skillet set over medium-high heat until the oil is lightly smoking. Add the dry potatoes, shake the pan to distribute the potatoes and oil around the pan, and cook, tossing and stirring occasionally until the potatoes are very crisp and golden brown on all sides, about 15 minutes. Meanwhile, heat the remaining oil in a medium non-stick or cast iron skillet set over high heat until the oil is shimmering. Add the chorizo and cook, stirring, until it is heated through. Continue cooking, stirring and tossing frequently, until all the liquid has evaporated from the pan, some fat breaks out, and the chorizo starts sizzling, and eventually is quite dry and well-browned, about 15 minutes. Transfer the cooked chorizo to the pan with the potatoes. Toss the ingredients to combine them and season to taste with salt. Serve the chorizo and potato mixture immediately with tortillas, onions, cilantro, salsa, avocado slices, sour cream and limes on the side. This meal comes together as quickly as any traditional taco meal might and you get something different for sure. I really liked the combination of the potatoes and chorizo and the heat and spice of the chorizo transferred really nicely to the rest of the dish. Combine it into a taco with some fresh avocado slices, salsa and sour cream and you have a real treat. I think Sean was little skeptical when I told him what I was making, but it seemed to go over pretty well for dinner as he gobbled up several of the tacos for dinner. 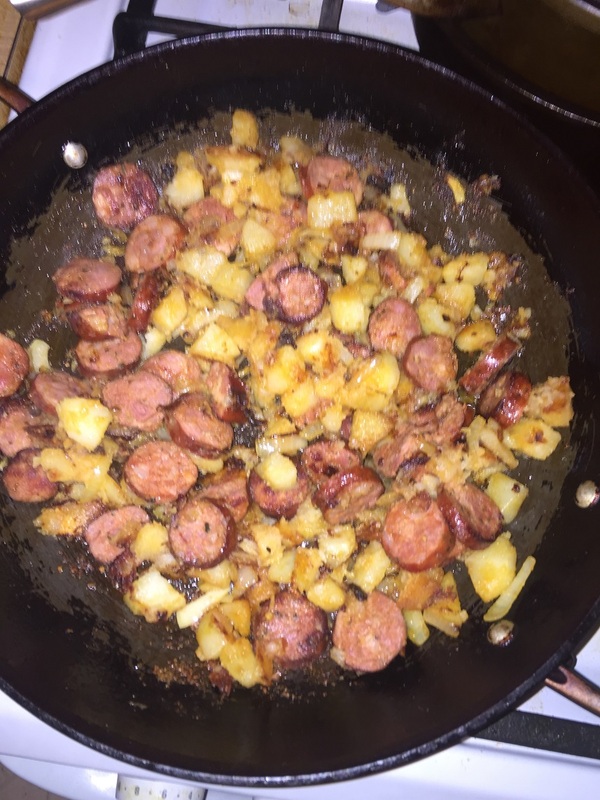 you want to get the potatoes really crispy and the chorizo nicely browned and crispy to really get the most out of it. I think this dish worked really well and I’ll be making it again. Thanks! It’s a good one for sure. Thanks for the comment!